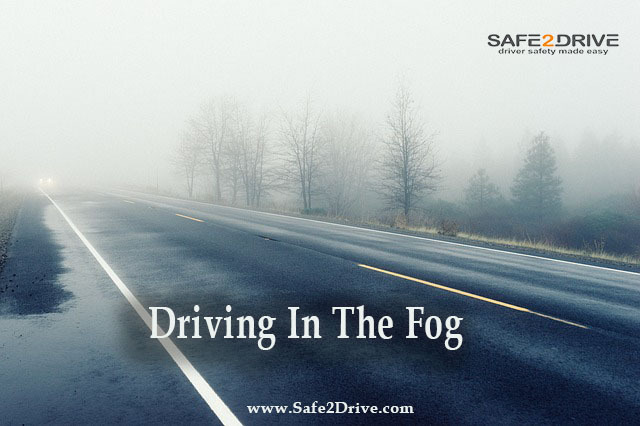 Fog can create extremely dangerous driving conditions that can come upon you quickly without warning. Fog is a cloud covering the ground formed when warm moist air mixes with cold air causing visibility to drop in a matter of minutes. Drive with low beams and fog lights on. High beams can worsen visibility because they reflect off the fog, making it more difficult for you to see what’s ahead of you on the road. Avoid using flashing lights while driving in the fog. Turn off your cell phone and the stereo. It is critical that drivers stay focused on the road to stay safe. Roll down your window to help you hear other traffic on the road. Use windshield wipers and defrosters to limit excess moisture on the window. Slow down and allow extra travel time to reach your destination. When you can’t see other vehicles or the road, a low speed can help you react safely. Use your speedometer as a guide to regulate your speed, because thick fog masks the sensation of speed by removing visual indicators of velocity. Turn off cruise control to give you more control of your vehicle. A safe following distance is crucial in fog. Drivers tend to "bunch up" during foggy driving conditions because they feel it’s easier to see. Following too closely is one of the big reasons why massive pile-ups occur. Leave plenty of distance between you and the vehicle in front of you to account for sudden stops or changes in the traffic pattern. To ensure you are staying in the proper lane, use the right-side pavement line as a guide. Following the lines and reflectors on the road will help you navigate the turns and twist in the road. As always, you should use your turn signals. Other drivers may be using your taillights as a guide, so alert them that you’re pulling off the road. When visibility is severely limited, find a safe place to park away from travel lanes and wait for conditions to improve. If you can’t see, neither can anyone else. Pull off away from the road. If drivers can’t see the shoulder, they likely won’t see your vehicle either. Turn on your hazard lights to help other drivers know you’re stopped. Safe2Drive aims to make driving safer. Our students are individuals who seek to improve their driving skills, keep points from their driving record, obtain insurance discounts, or earn their driver's license. We achieve our goal by providing engaging, timely, and effective traffic school, defensive driving, mature driver, and driver education courses over the internet.